KEEP FROZEN UNTIL READY TO USE. DO NOT REFREEZE In deep fryer, heat oil to 350°F. 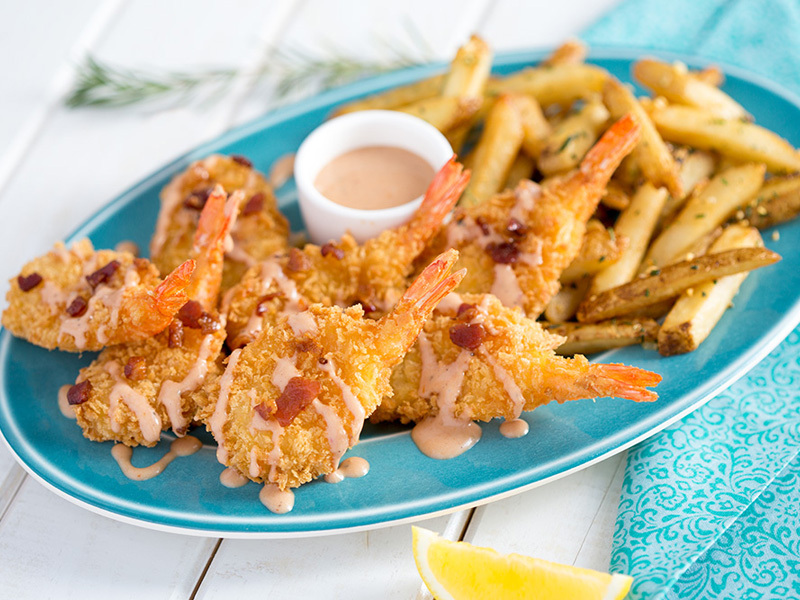 Add shrimp, shaking baskets to prevent shrimp from adhering. Fry for 2½ to 3 minutes. Shrimp, Wheat Flour, Water, Modified Food Starch (Corn, Tapioca), Soy Flour, Corn Flour, Salt, Garlic Powder, Onion Powder, Leavening (Disodium Diphosphate, Disodium Bicarbonate), Whey Powder, Dextrose, Sugar, Mono And Diglycerides (Emulsifier), Shortening (Palm, Coconut Oil), Sodium Tripolyphosphate (To Enhance Moisture), Yeast, Turmeric, FD&C Yellow No. 5, FD&C Yellow No. 6, Sodium Bisulfite (As A Preservative). CONTAINS: SHRIMP, WHEAT, SOY, MILK.